A maxi dress is the everyday woman's dress, just as perfect for a casual rendezvous with friends as it is for an evening on the town. The ideal dress for any figure and fashion style, you'll fall in love with EziBuy's range of maxi dresses for day and night. 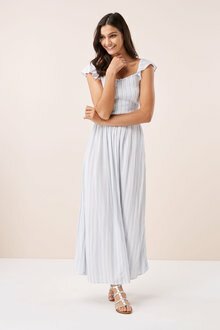 Whether you're looking for a slimming maxi dress for a casual dinner party or something more amped up for the special occasion, EziBuy has you covered. Browse our variety of unique colours and fabrics for the perfect maxi dress to suit your needs. Snap up a gorgeous maxi dress with paisley or floral prints for your next holiday, or grab a flattering evening dress with a plunging neckline for an elegant formal look. All EziBuy dresses are designed to create a timeless and effortless look. Simply match your maxi with a pair of wedges or high heels and a few choice accessories to create a stunning look. 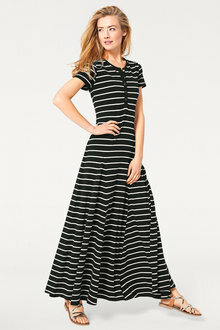 A maxi dress is a staple in every woman's wardrobe. Browse EziBuy's collection of beautiful maxi dresses to create a long and lean silhouette you'll want to show off!